When someone comes into your life at its lowest point to help you survive – maybe that’s an angel. 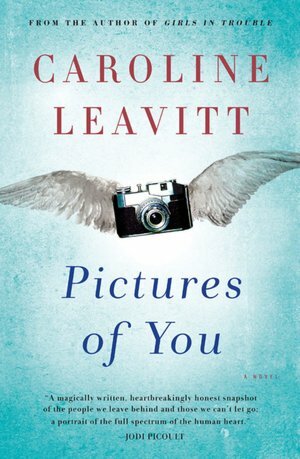 In Caroline Leavitt’s Pictures of You, a car accident leaves nine-year-old Sam confused but hopeful, not realizing his angel is the woman who drove the other car. Leavitt weaves the story around two unhappy women in their thirties who have decided to run away. Isabelle is leaving her unfaithful husband Luke, when she discovers he has been carrying on an affair with another woman who is now pregnant. April seems happily married to Charlie, with a devoted relationship to her asthmatic son, Sam; her reason for escape is a mystery that continues through much of the action. The families, both living in Cape Cod, are brought together by the two cars colliding on a deserted foggy road. Young Sam, thinking Isabelle is an angel come to help him reconnect with his dead mother, finds comfort in her gentle overtures and a reprieve from his grief when she teaches him how to use a camera. Sam’s affinity for photography, and Isabelle’s yearning to leave the small-town photo shop to become a professional photographer in New York motivate a connection that eventually leads to Charlie. Although the premise sounds trite, Leavitt does not let the relationships fall into the expected formula. The characters’ vulnerabilities in a time of crisis ring true as do the reactions of those around them – “you find out who your real friends are.” The drama focuses on how lives change irrevocably, not only because of the accident and how the survivors try to cope, but also how judgmental opinions shade decisions. This entry was posted in authors, book review, books, reading and tagged Alice, Cape Cod, Caroline Leavitt, Jodi Picoult, Leavitt, New York, Traffic collision, United States. Bookmark the permalink. Thank you for the wonderful review of my novel!